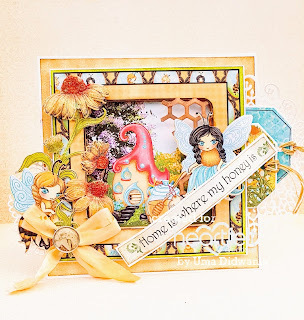 Today i am back with a new card featuring Heartfelt Creations 'leafy Accent Stamp and Die. I create a U- fold card using Sweet As Honey Collection and leafy accent collection. Smooth white cardstock, Archival Ink Pad ( Venetian Orange, Red Geranium , Leaf Green) , Distress Oxide ( Vintage Photo , Spiced Marmalade ) Glossy Accent , Glitter , , , Cheese cloth. 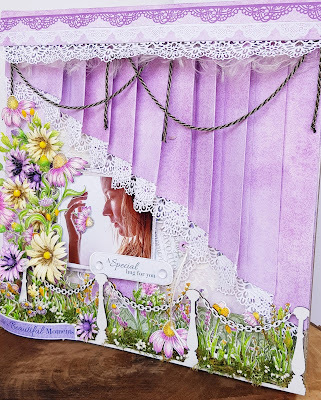 Ready open card measures 10"×7"
To create a U-fold card follow the amazing instructions by "Maymay made it" . Create a U-fold card with the white cardstock. 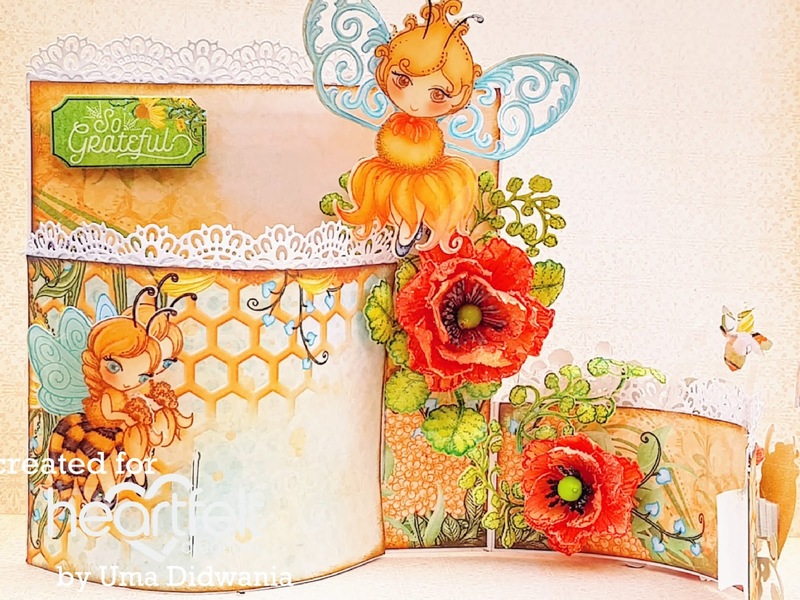 For mating choose a pattern paper from the sweet as honey paper collection. Distress the edges of the pattern paper using venetian orange ink. Stamp the sweet peony flowers using red geranium color on white cardstock and cut with the coordinating die. 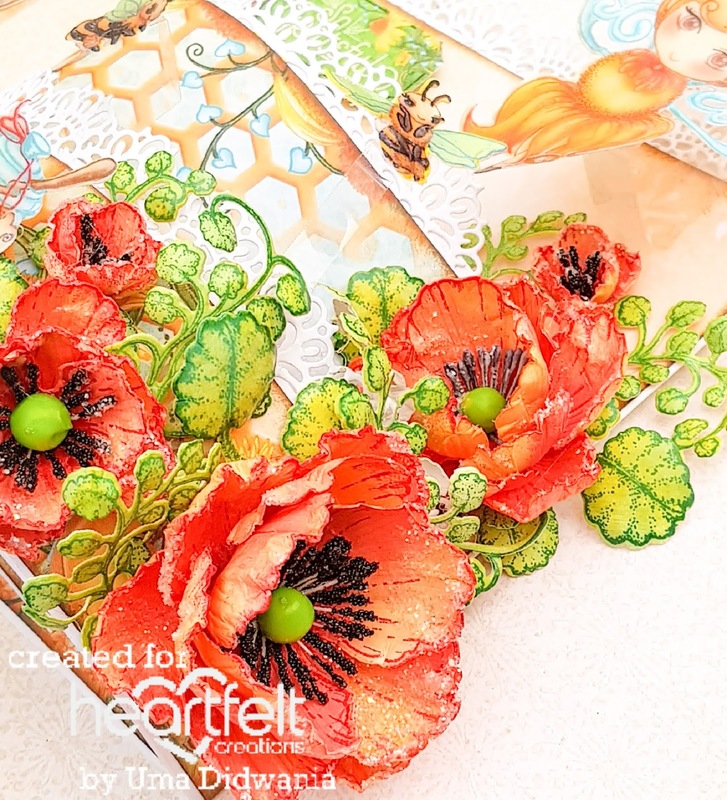 Color the flowers with venetian orange and shape them using deluxe flower shaping kit. 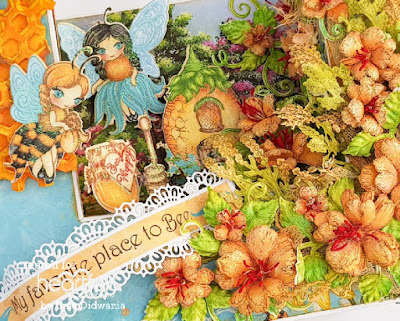 Stamp the leafy accents leaves using leaf green color, cut with co-ordinating dies and paint with the same color. 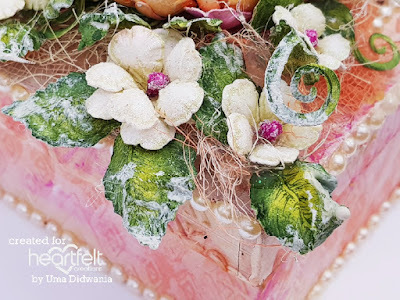 Shape the leaves using leafy accent shaping mold. Also stamp some leaves from the garden's edge coneflower stamp. 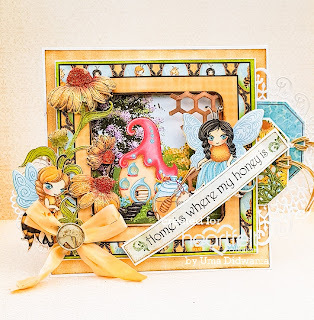 Cut a yellow cardstock using honey comb die and slightly color it with distress oxide vintage photo and spiced marmalade. 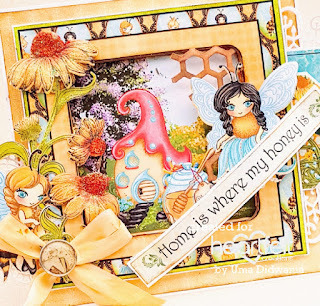 Apply glossy accent on the honey comb die as shown in the picture. Cut some preprinted images from the pattern paper using their coordinating die. 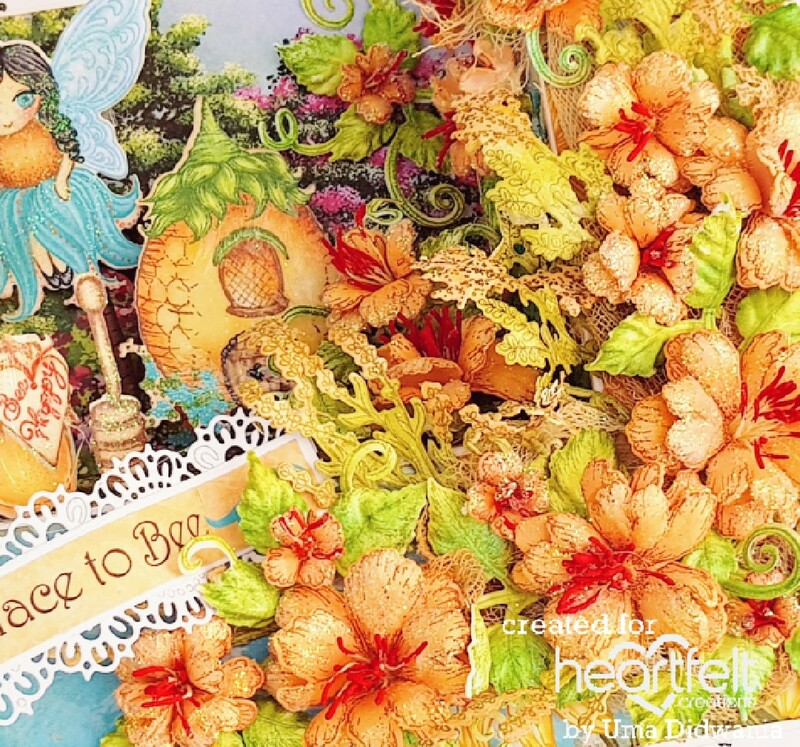 Glue a cheese cloth on the left side of the card and start arranging flowers and leaves. Glue them with hot melted glue. Glue the honey comb die on the right side of the card. 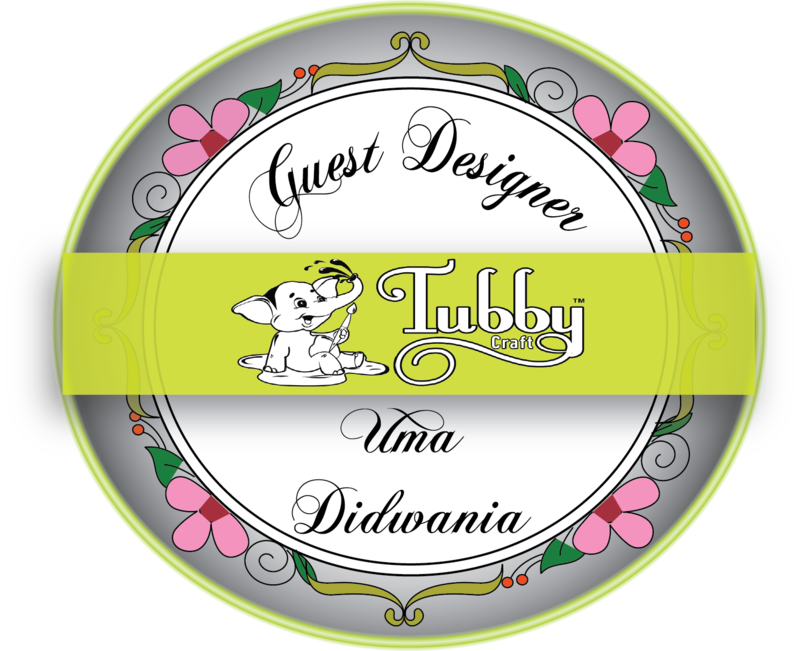 Glue the preprinted images using acetate sheet for added dimensions. 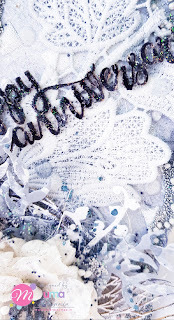 Cut the borders from the white card stock using sweetheart border die and glue them on the both edges of the card. Cut a sentiment strip from the same paper collection. Glue the borders on both side of the strip and arrange it as shown in the picture. For finished looked apply glitter that dries clear. 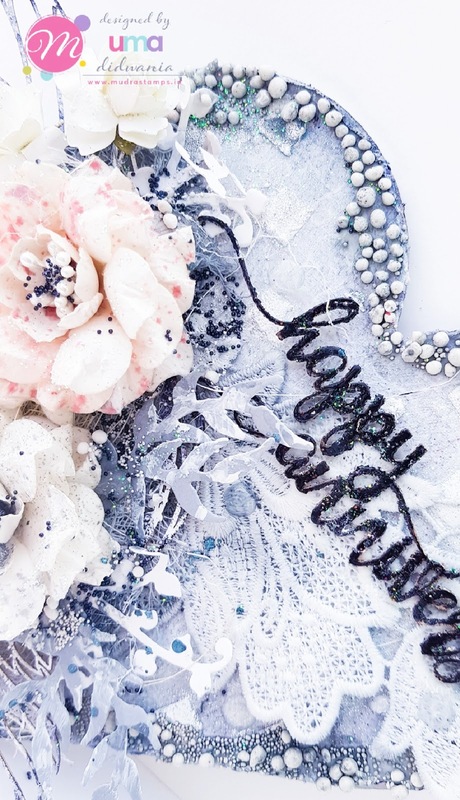 For more tips on creating with the Sweet Peony collection, watch the tutorial athttps://youtu.be/L9_MLkvpGPQ. Take a mdf box and apply gesso evenly. After drying apply texture paste using stencil. 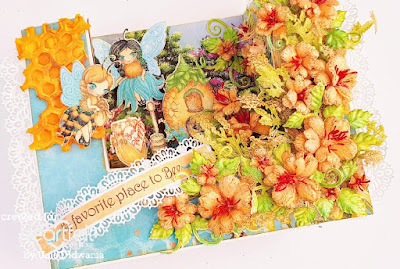 Color the box with Lindy’s starburst sprays. 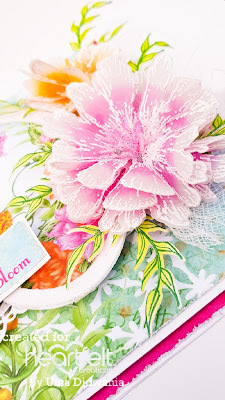 Stamp Sweet Peony flowers on the flower making paper using cactus flower ink, also stamp some Wildwood Florals flower using sap green color and cut with coordinating die. Paint the peony flowers with cactus flower and venetian orange color. Shape the flowers using Deluxe Flower Shaping Kit. Stamp the leaves using olive green ink and cut with coordinating dies. Color the leaves using leaf green , library green and olive green color. 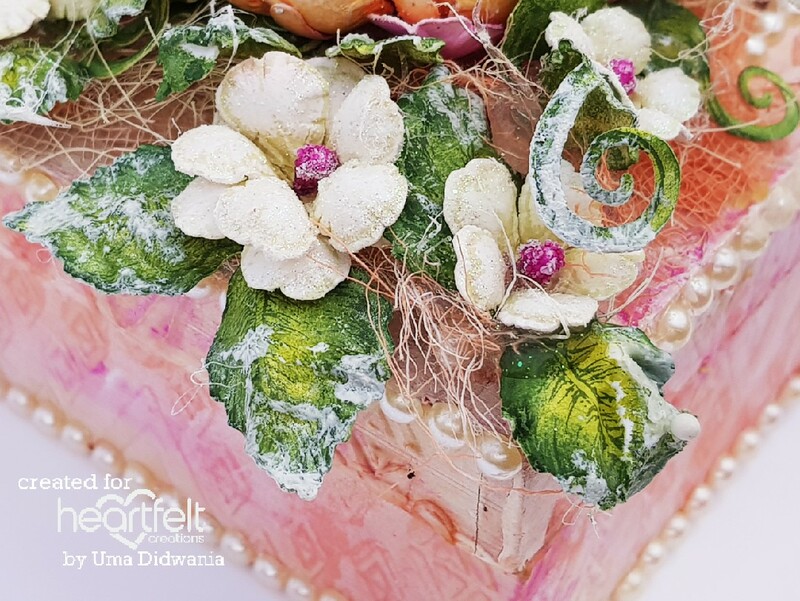 Shape the leaves using leafy accents mold. 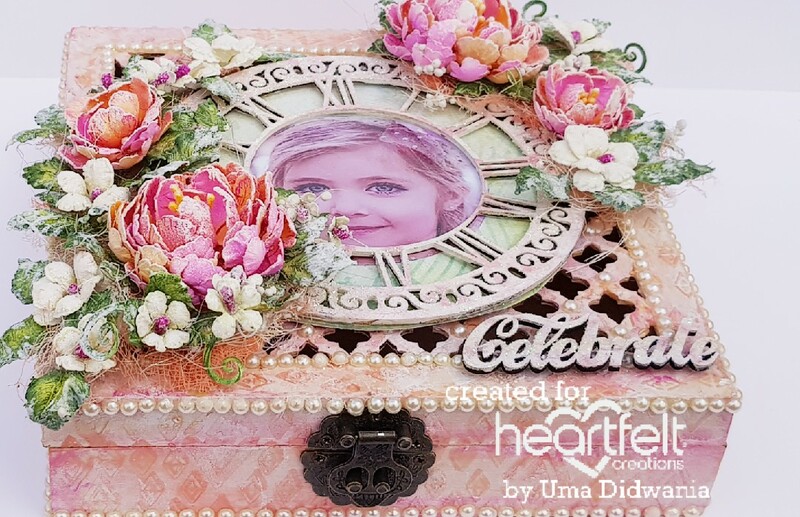 Take a mdf clock frame and a sentiment, color them with white acrylic color. Also spray with pink color. Apply glitter on both using adhesive that dries clear. Take a pattern paper from Young at Heart collection and cut it according to size of frame. Also cut a acetate sheet of the same size. Glue a pic and acetate sheet on the pattern paper. Glue the frame over the pattern paper as shown. Adhere the frame on the centre of the box. Glue the cheese cloth and sisal near the frame. 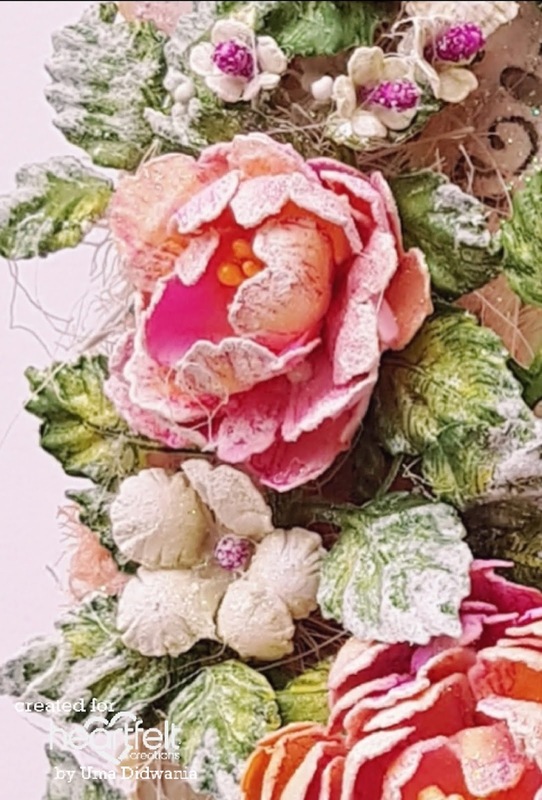 Arrange the flowers and leaves around the frame and glue them using hot melted glue. 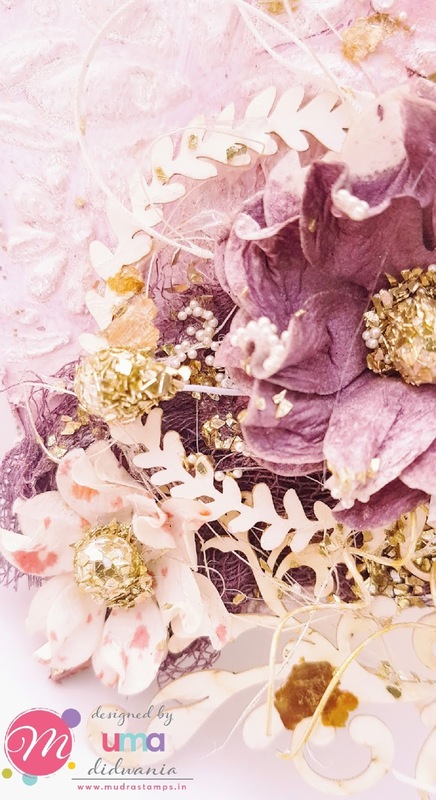 Apply the glitter over the flowers. 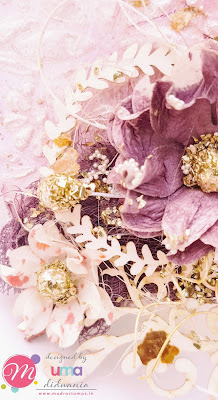 Futher apply the gesso on the flowers and leaves using dry brush technique. For the finished look glue half cut pearl on the edges of the box. 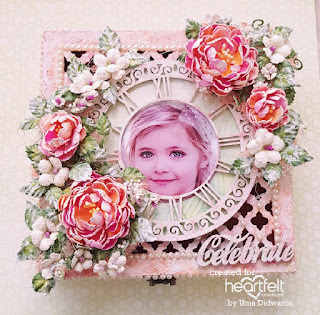 Visit Heartfelt Creations blog for more amazing projects by DT member . It's time for Wednesday inspirational post for Heartfelt Creations. So, here I am with a new project with Sweet As Honey Collection. These bees are so cute, isn't it??? Ready upside fold card measures 6.5"×6.5". 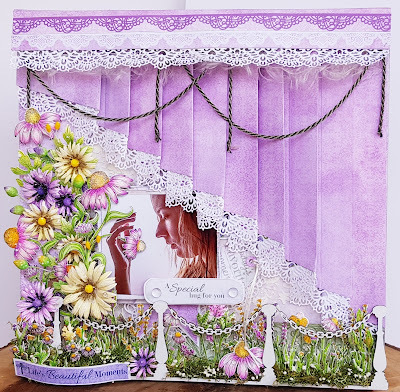 Choose a 6' by 6' card panel from the Sweet As Honey Paper Collection and cut the center square window. Also, distress the edges using a distress oxide vintage photo. Choose another pattern paper and create a window scene by layering the same with the help of glue dots. 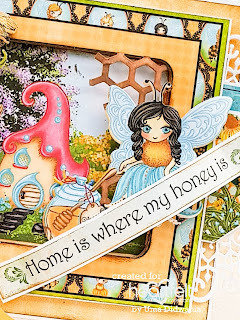 Cut white cardstock using Honeycomb die and color it using distress oxide vintage photo. Glue the die cut on the left corner of frame card as shown. Cut two tags from the same collection. Also cut white cardstock using Decorative Medallion Die. Glue the tags and border on the left side of frame card. Cut a dolly from the white card stock using Butterfly Kisses Decorative Die and glue it on the right side of the frame card. Further, create a yellow color mat and distress the edges and layer it using glue dots. Once happy with all layering, glue the card front to the ready card base. Stamp some cone flowers on white cardstock using black archival. 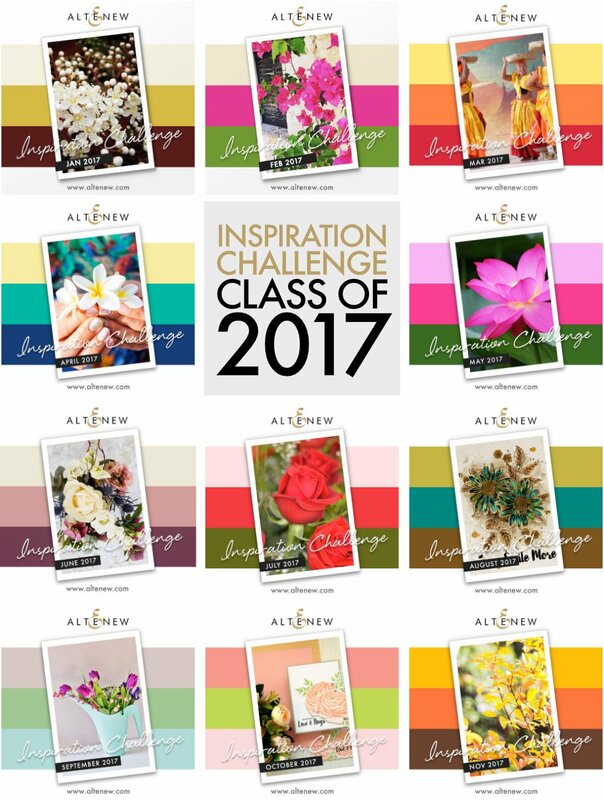 Color the flowers using chrome yellow and red geranium archival. 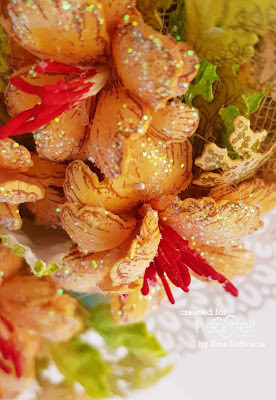 Slightly shape the flowers using Deluxe Flower Shaping Kit. Cut some preprinted images from the same collection. 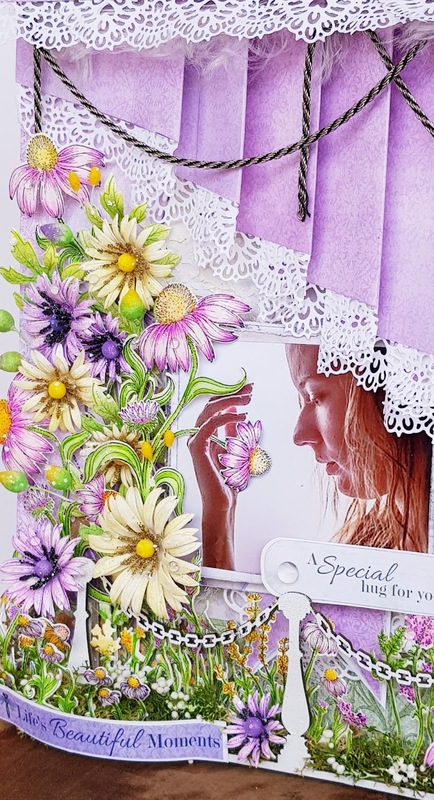 Arrange flowers and images as shown in the picture using glue dots for dimensions. Tie a bow with the satin ribbon and glue it on the right corner of the card. Cut a sentiment strip from the designer paper pack and glue it as shown. For the finished look apply glitter on the flowers center. 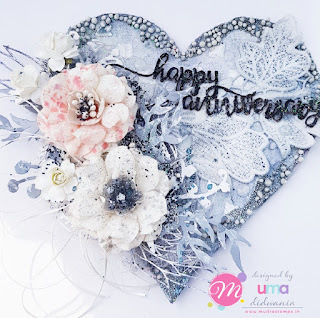 I create a heart shaped anniversary card for Mudra's blog. 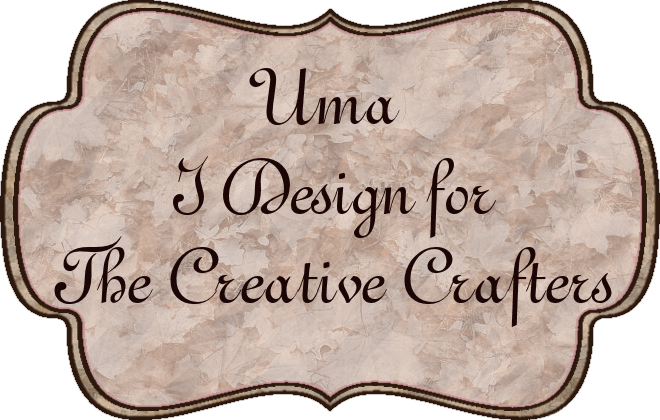 You can check here step by step instructions and list of supplies i used. Our theme is always "Anything Goes ". 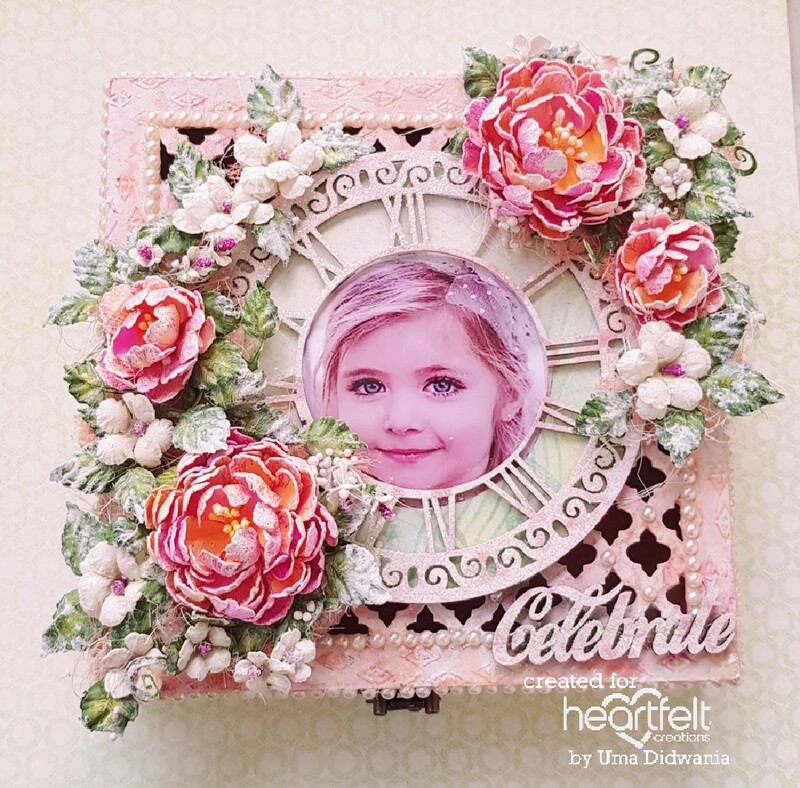 As a inspiration I create a layout using heartfelt creations products. 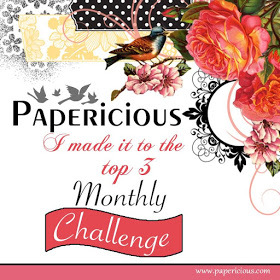 Choose a pattern paper from the Backyard paper collection. Adhere it on the thick chipboard. Choose 2 another pattern paper from Lush lilac paper collection and create a curtain. Glue sweetheart border die cut on the edge of the curtain. Apply modelling paste on the base paper using stencil. Take a photo of 3.75"×3.25". Cut two photo matt (4"×3.5" and 4.25"×3.75") from the same paper collection. Distress the edges of the photo matt using scissors. Glue the photo matt on the base using dimensional tape as shown in the pic. Glue the photo over the photo matt. 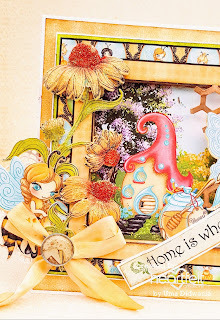 Cut a dolly die cut using Butterfly Kisses Decorative Die. Also cut a tag from the same paper collection and add a cord. Arrange the dolly and tag around the photo matt as shown in the pic. 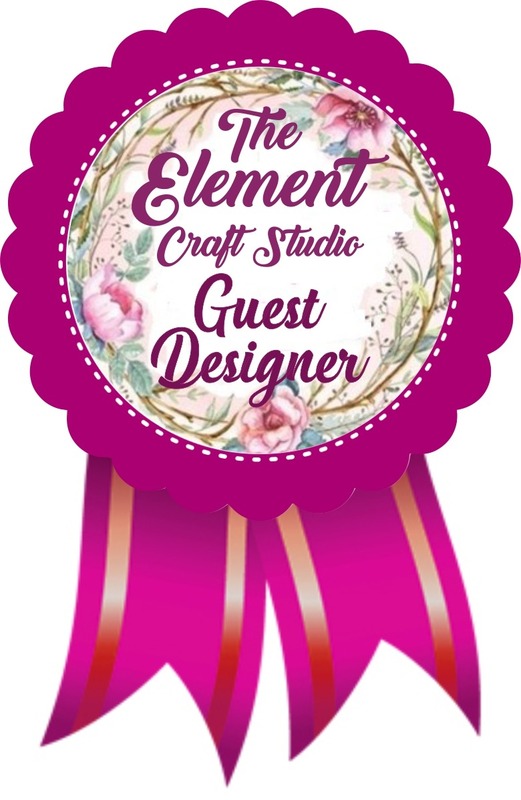 Arrange the curtain using dimensional tape for added dimensions. Glue the green moss at the bottom of the layout using glue that dries clear. Stamp flowers and fillers from Backyard Collection using black archival and color using zig markers. Cut them with coordinating die. Shape slightly using deluxe flower shaping kit. Also make some aster flowers and leaves using Delicate Aster stamp and die.. Glue them as shown in the pic. Color some styro foam buds using archival ink. 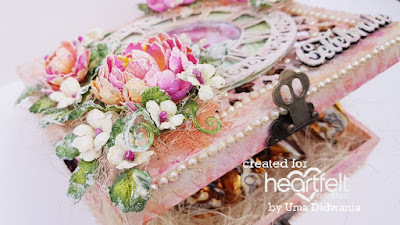 Take a fence chipboard and heat emboss it with white embossing powder. Glue the chipboard at the bottom of the layout as shown. 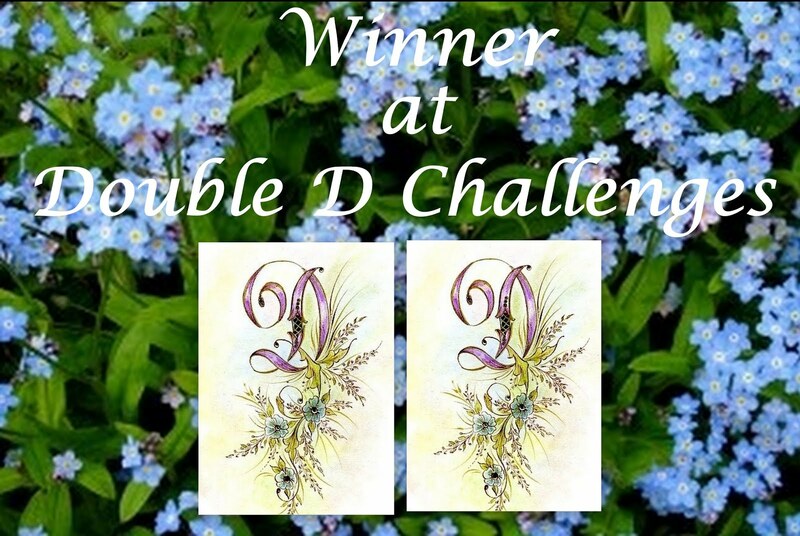 Cut two sentiment tickets from the Lush lilac paper collection and adhere on the layout as shown. For the finished look apply sparkling dust on the flowers and some art stones using adhesive that dries clear. 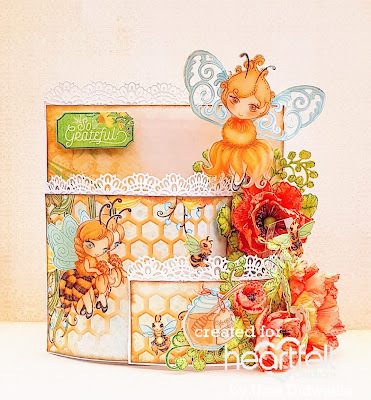 Today is second Wednesday of the month and Heartfelt Creations launch an amazing collection "Sweet As Honey". 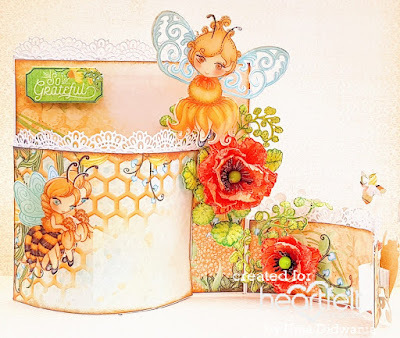 whether you’re needing to send “bee-lated” birthday greetings, remind someone to “bee-lieve” in themselves, or simply let someone know you’ll “bee” thinking about them, you’ve not only accomplished your act of kindness through remembering and touching the hearts of friends and loved ones with your creative projects, but you’ve refreshed your soul and refocused your heart as well! 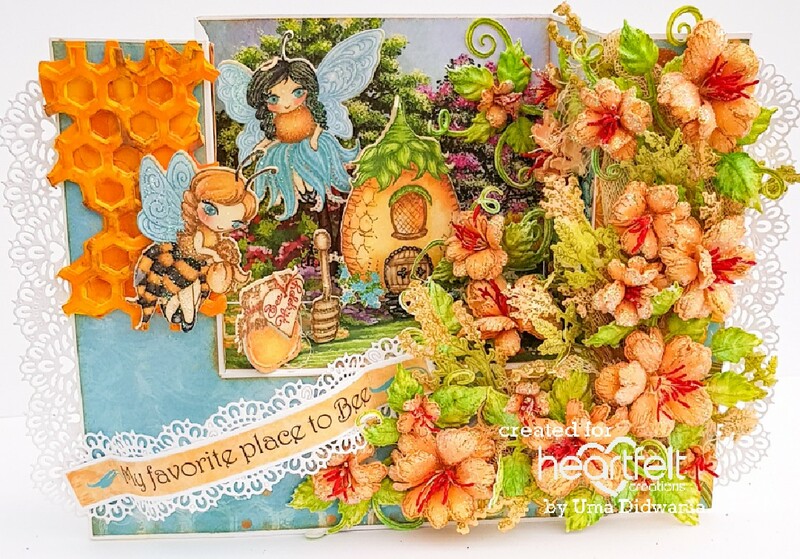 Join us in spreading joy and “bee-autiful” creations with the new Sweet as Honey Collection by Heartfelt Creations! 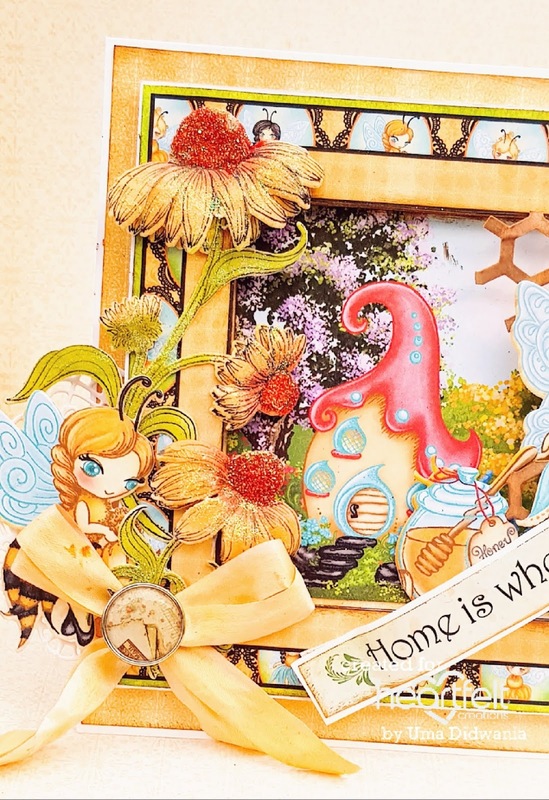 “Swarming” with stunning illustrations of whimsical honey bees, charming hives and “bee-autious” garden scenes, this fun and lighthearted collection is ideal for creating projects for a multitude of occasions and is sure to capture the hearts of the young and the young at heart! A bright and happy hued paper collection will fill your soul with rays of warm sunshine yellows, bright sky blues and rich golden honey colors, while boasting captivating honeycomb patterns, happy hexagons, delightful polka dots, perfect plaids and dreamy florals! 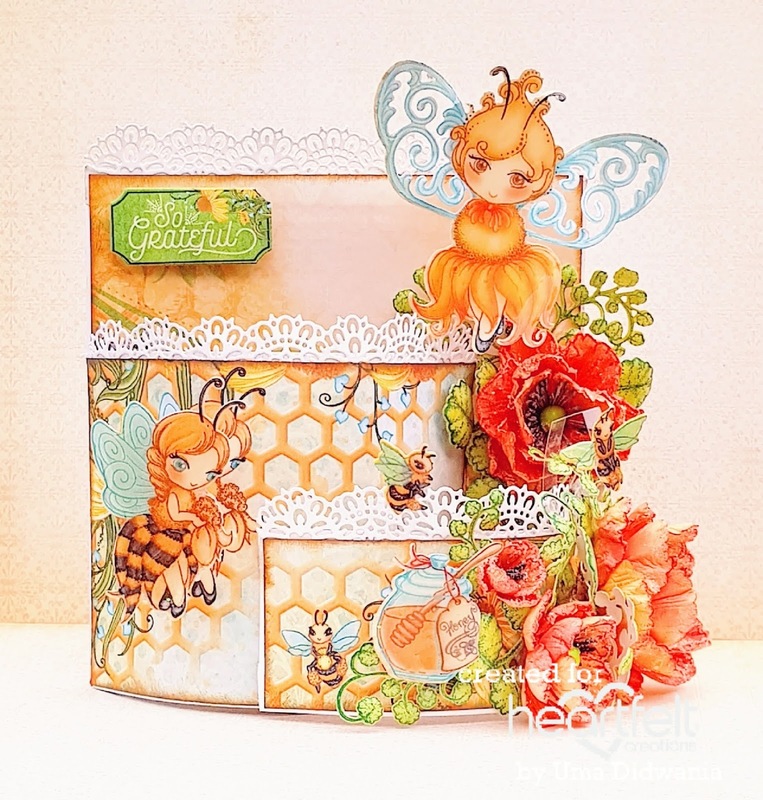 An assembling of three “bee-coming” cling stamp sets, along with coordinating dies provide endless inspirations with a “bee-autiful” colony of honey bee maidens, whimsical hives and sweet sentiments ideal for pairing with honeycomb die cuts! 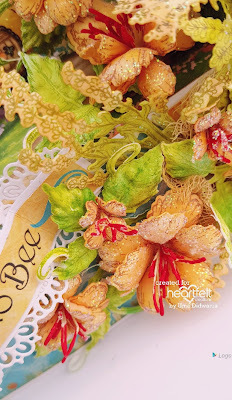 So, now that you know what all the “buzz” is about, join us in “bee-ing” Sweet as Honey and sharing “bee-autiful” art from the heart wherever you go! Here is my card with this bee-autiful collection. 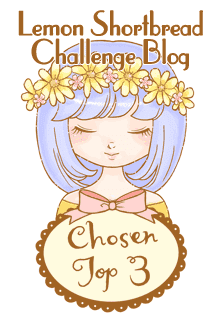 I create a Bendi fold card. To see how to shape the poppy, watch the video at https://youtu.be/83jv-zjmdag. 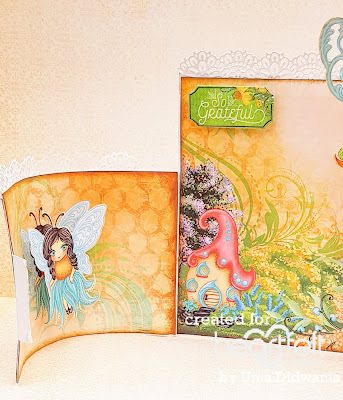 Create a Bendi-Card by following these easy and wonderful instructions by Susan Campfield, check tutorial here . Choose a designer paper from Sweet As Honey Paper Collection for mat. Distress the pattern paper using distress oxide vintage photo. Cut the borders from white cardstock using Sweetheart border die and glue them on the edge of the card as shown in the picture. Cut some preprinted images from the designer paper using coordinating dies. 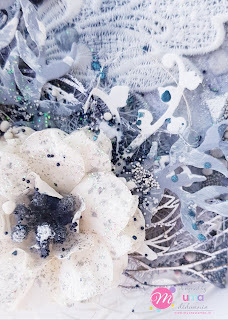 Apply a thick layer of glossy accents on the images and leave them to dry. Stamp some poppy flower on the white cardstock using Red Geranium and cut them with coordinating die. 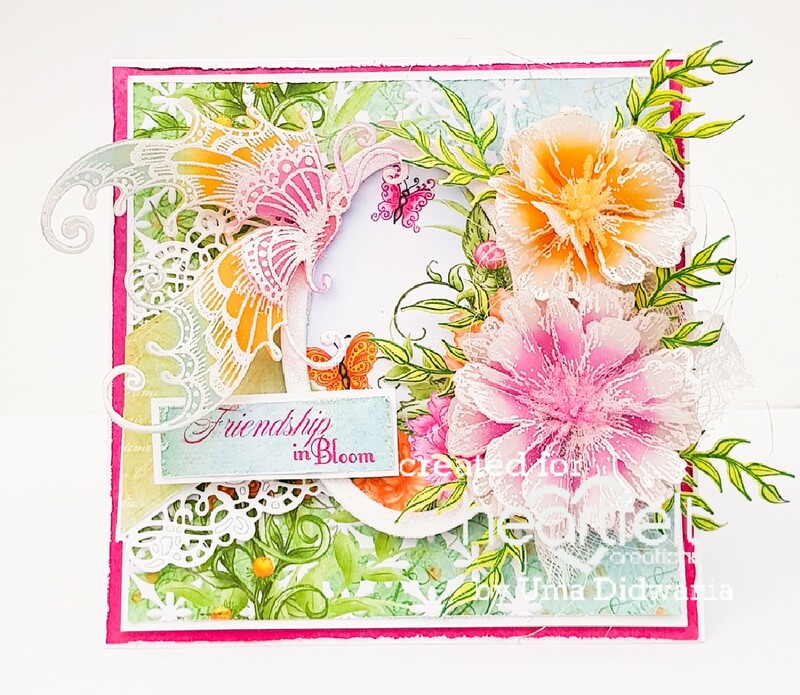 Color the flowers using Tiger lily and Venetian Orange. Shape the flowers using groove tool and create flowers. Stamp some leaves using library green ink on the white cardstock and color them with leaf green and chrome yellow. 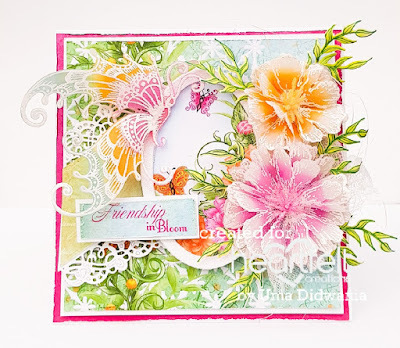 Cut with coordinating die and shape them using deluxe flower shaping kit. Glue flowers and leaves on the card using hot melted glue. Arrange the all images on the card using clear sheet for added dimensions. Cut a sentiment tricket from the same collection using tag and luggage die and adhere on the top right side of card using dimensional tape as shown in the picture. 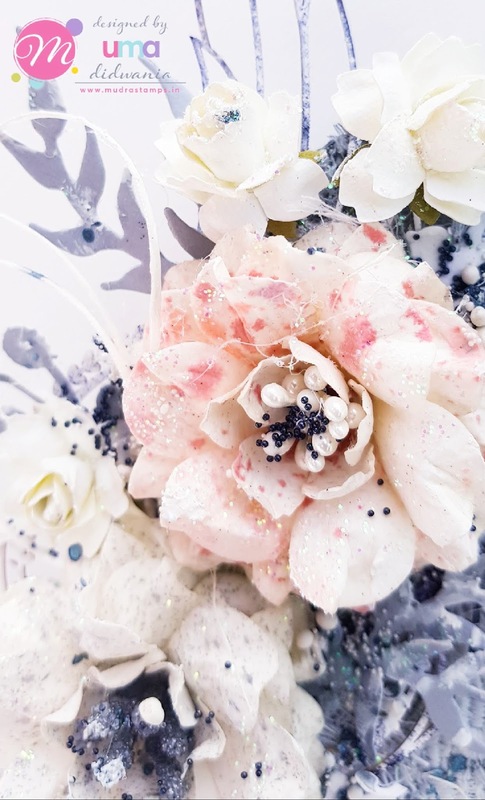 For the finished look apply glue on the flowers and sprinkle some glitter on it. 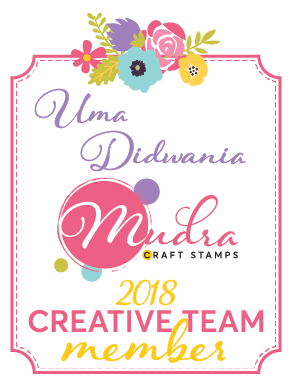 Today I'd like to share sneak peak of my project which I created for Mudra's Craft Stamp Blog. I altered mdf boxes in mixed media form. 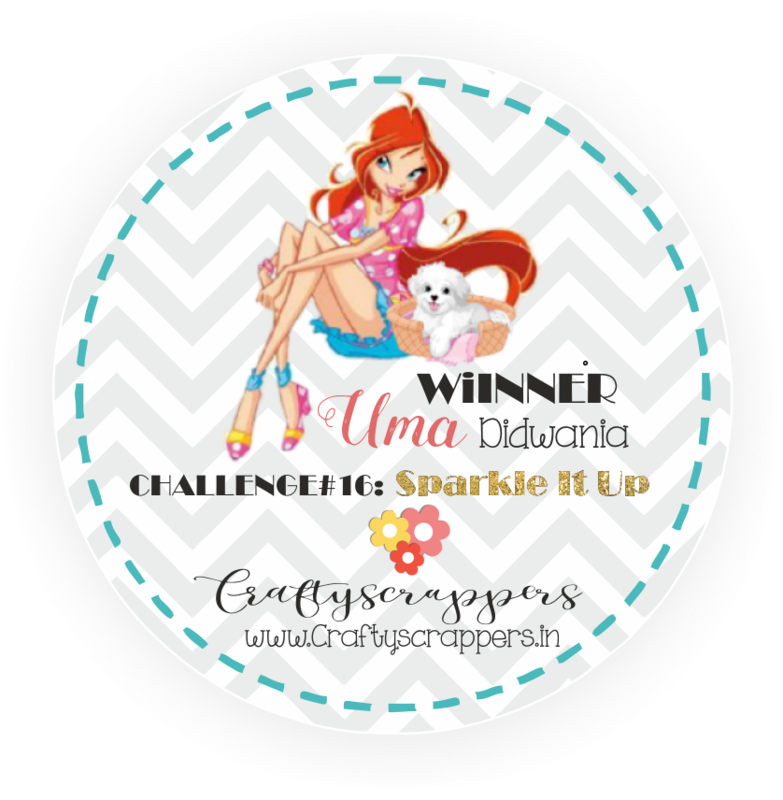 Hop on the blog for for pics and step by step instructions. Hope u all like it. .
Today, I am here with another card with Butterfly Dreams and Sweet Peony collection from Heartfelt. I totally inspired by "Rajni Chawla" maam for this card. Ready upside fold card measures 6.5"×6.5"
Choose a designer paper from Butterfly Dreams Paper collection and cut into 6.25"×6.25". Adhere it on the card base using tacky tape. Also choose another paper from the same collection and cut into 6"×6". 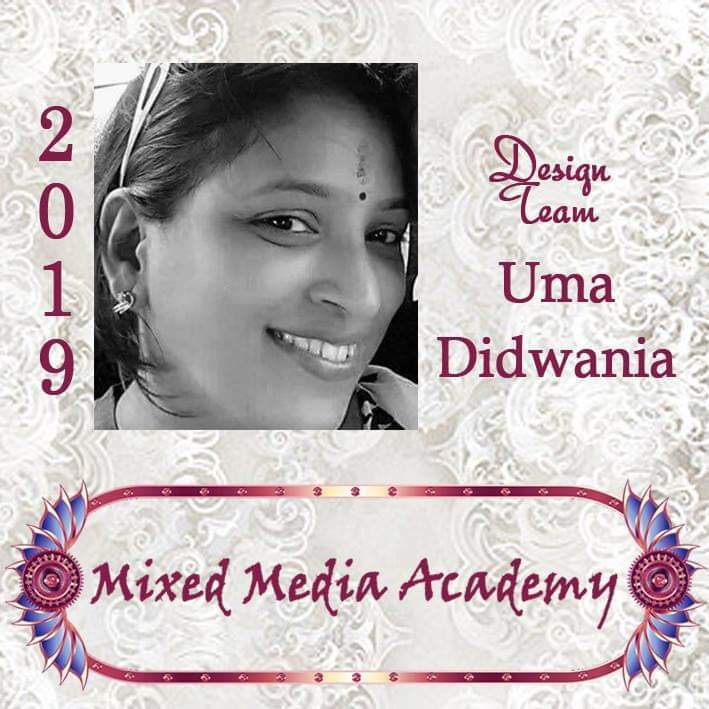 Adhere that on the card using dimensional tape for added dimensions. Cut a 2"wide border using Felur border basic die and adhere that using dimensional tape as shown in the picture. 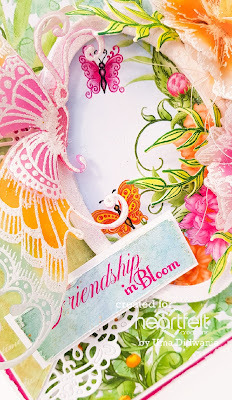 Create a frame using Eyelet oval and basics large die. Also cut a paper from the same collection to create a window scene. 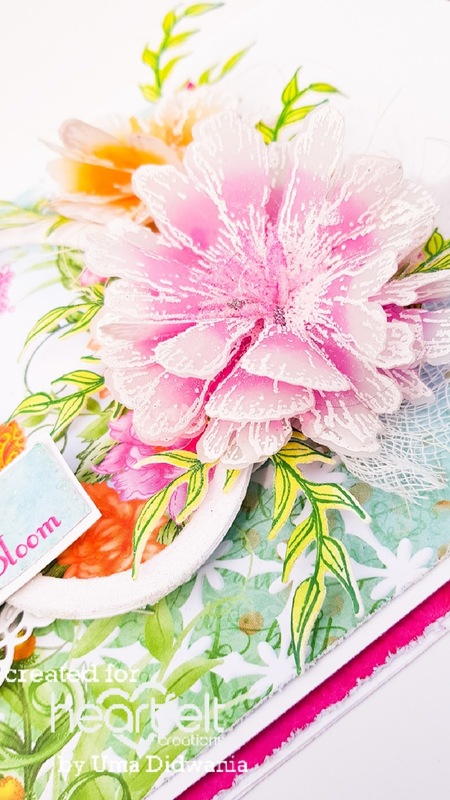 Stamp large Sweet Peony flower using versamark on vellum paper and heat embossed it with white embossing powder. Also stamp a butterfly on vellum paper using versamark and heat embossed with white embossing powder and cut with coordinating die. Color the flowers with vibrant fuchsia ink and spiced marmalade distress oxide and shape them. Color the butterfly using vibrant fuchsia ink, broken china, spiced marmalade. Stamp some leaves using library green ink on white cardstock and color then with leaf green ink. Cut them with coordinating die. Arrange all as shown in the picture and glue them using hot glue. 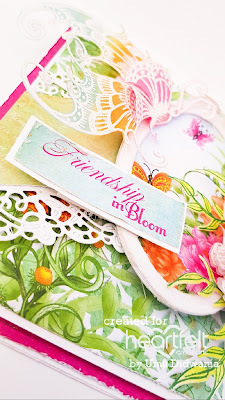 Cut a sentiment ticket from the same collection and glue it using dimensional tape. For the finished look apply rainbow glitter using adhesive that dries clear.